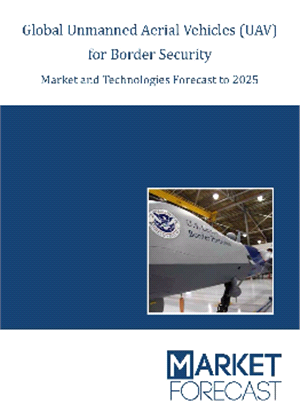 The global Unmanned Aerial Vehicles (UAV) for Border Security Market is valued at US$ 1,785 million in 2017 and is projected to grow at a CAGR of 6.8% to US$ 3,031 million in 2025 with a cumulative market volume of US$ 23,212 million. Unmanned Aerial Vehicles (UAVs) have been part of security effort for more than a decade, with rich nations like the United States and Brazil flying very expensive aircraft on their borders. You’d think UAVs would then be an easy sale to any nation with such problems. You’d be wrong, and sometimes right. Yes, this is a confused and confusing market. This new report cuts through that confusion to first explain the technologies involved and then forecast their markets by regions. It adds value to that insight with two scenarios, one covering today’s reality and one forecasting each region’s reaction to a successful cross-border terror attack. The results are unexpected given the complexities of national privacy laws (affect internal security operations) and military inventories (allow security agencies to immediately increase border patrols without buying UAVs). Global market share assessments for all types in market volume for 2017 to 2025. Uniquely, this forecast also includes many “Opportunity Alerts”, very focused marketing tips included in context where a business developer should capitalize on customer needs. 4.1 What is an Operating Concept? 4.3 Does the US Customs and Border Patrol (CBP) Have an Operating Concept? 5.4 US Market Dominance – Decline or Increase? 5.5 So, How to Sell?